Now we are living a fast life, and spending lots of time in the kitchen preparing food is sometimes easy said then done. We may feel too tired after a long days work or just too starved to endure a long time waiting for a soup or something. The simple choice is to go to the restaurants near home and just make go of another dinner again, but the living price would be too high if you went to the restaurant too often. I have figure out an alternative way, and simple recipe that only require half a hour at most, and still can fill your stomach full at a cheap cost. The answer is noodles. I'm not taking about the Italian noodles or the instant noodles, which could be classied into the trash food catagory. 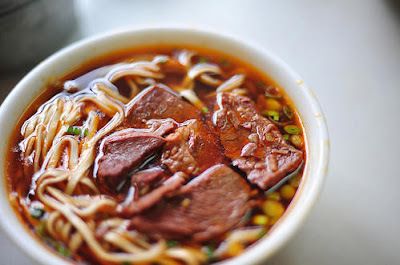 I'm saying the Chinese noodles which is a famous representative of chinese food culture too. It comes so many choices concerning the varitety of the noodles. I personally like the hand made noodles, that is one kind of noodles very common in the market. It won't be preserved a long time and you need to buy it fresh, so it tasted greater than those processed noodles which could be placed a long time. The recipe is so simple, the most lazy way is too boil it ripe in the water ( 5 minutes) and than put in a bowl, than add some vinegar, some salt, some pepper juice, some onion. Better if you got some green leave vegetables, then add them too, first boil them ripe too. The key of the complicated ones lies in the soup accessory, you can make it complicated as possible if you got enough time, you can prepare the soup ok, any soup you like.